Back in 2013, Damon Slye, whose name will be immediately familiar to joystick jockeys of a certain age, started up a Kickstarter to support a reboot of the famous flight sim Red Baron. It failed rather badly, pulling in just $40,000 on a goal of $250,000 before Slye pulled the plug (the video above is from that failed campaign). He said in an October 2013 update that his studio, Mad Otter Games, would spend the next few months "honing our message and vision," and would move ahead with a new crowdfunding campaign in early 2014. It never happened, and that, by all appearances, was the end of it. But as it turns out, Slye has not given up. The problem with the initial campaign, he said in an interview with Polygon, was that his studio failed to "build a community" in advance of its launch, and didn't properly present its ideas. "The game didn't look right. It looked a little arcade-ey," he said. "It didn't look like living history, interactive history, which is more what it should look like." Slye is now hoping to drum up $50,000 to fund the creation of a "decent prototype," which he can then use as the foundation for another, hopefully more successful crowdfunding campaign. And he does appear to be putting a much greater emphasis on authenticity this time around. "It used to be that the engines actually spun on the crankshaft. They were attached. It's this huge mass of metal spinning, and that creates torque forces like a gyroscope," he said. "In terms of making it authentic, you want to add all these things in there so it's real. The Sopwith Camel, it could turn faster to the right than to the left because of the gyroscopic effects. Those are the kinds of things that add the real nuance to the whole thing." Will that be enough to put a new Red Baron Kickstarter over the top? It was a tremendously phenomenal game in its time, but the days when a joystick was a mandatory piece of gaming kit are long gone. 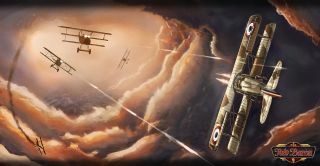 A rebooted Red Baron would never be a mainstream hit; the question is whether it could draw enough interest from fans of that now-niche genre to enable Slye to make it happen. Admission of bias: I certainly hope so.